Publishing a task is a way for businesses to crowdsource creative works to the crowd. A task is a request from the business to Crowdholders, that Crowdholders should do some works for a token reward. These creative works includes, solving problems, validating ideas or concept, providing feedback, marketing assistance, online assistance and other tasks. Please read the philosophy of task design to know more about task design. Tasks can be categorised according to its problem stage. There are three different types of task for different purposes. They are Assignment tasks, Problem-solving tasks and Innovation tasks. An Assignment task is designed for businesses to crowdsource their assignments. Assignments are at the late stage of a problem. It has both clear objective and instructions for Crowdholders to complete the task. Required steps for the tasks are introduced by businesses to Crowdholders, so stated methods/ instructions are applied by Crowdholders to help businesses reach their goal. 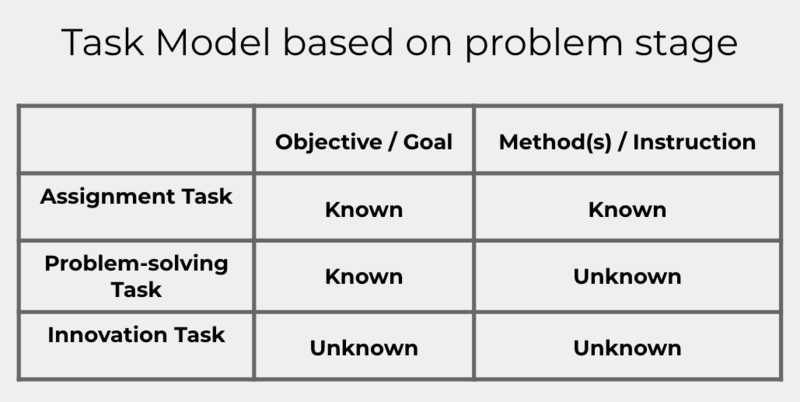 A Problem-solving task is designed for businesses to illustrate a well-defined problem which they must solve before achieving desired improvements. Problem-solving often happens at the middle stage of a problem. It has a clear objective. However, the method or the instruction for achieving this objective is unknown, that Crowdholders need to discover it. A Innovation task is designed for businesses to identify their problems or development needs. Innovation is often happens at the early stage of a problem. Both objective and method are unclear for businesses. A Innovation task aims to identify the problem or the need, and define them. So later others can have an objective to produce a method for. Obscure problem is clearly identified, or initial complex problem is segmented in partial clearly defined problems by the crowd. For each partial problem several ideas must be generated. The complementary solution ideas are combined to a robust solution concept delivers solution for all partial problems. The side-effects of solutions such as costs, risks, or research & development expenses are identified and optimized.